These Claddagh stud earrings are crafted in 14K white gold and feature diamonds. These Claddagh earrings are crafted in 14K white gold and feature diamond studded hearts along with diamonds in the cuffs and the top of the ring. The 32 individually set round brilliant stones have a SI 1 -2 clarity and are G - H on the color scale with a total diamond weight of 0.15ct. 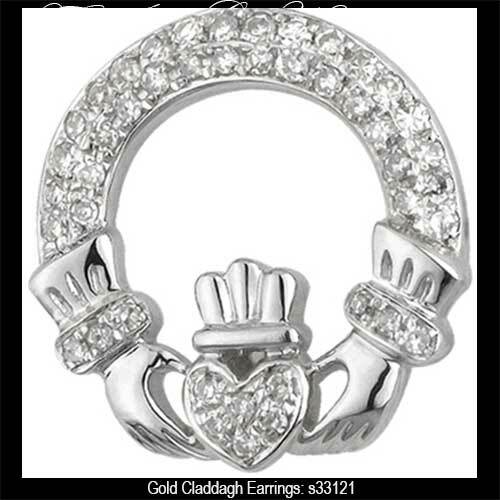 The diamond Claddagh earrings measure 3/8" diameter. 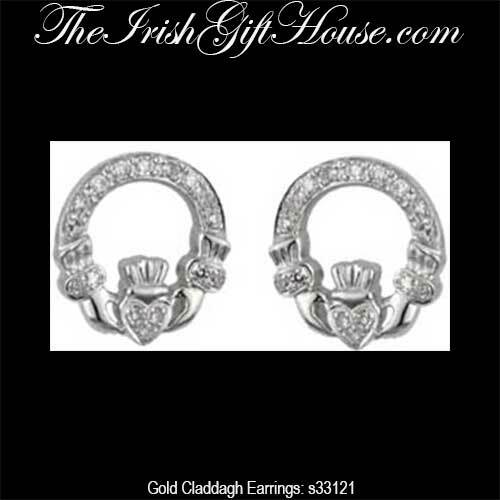 The stud earrings, with push on butterfly backs, are made by Solvar Jewelry in Dublin, Ireland and it is gift boxed with a Claddagh history card that is complements of The Irish Gift House. Claddagh necklace is a white gold design that is set with almost 1/4 carat diamonds.